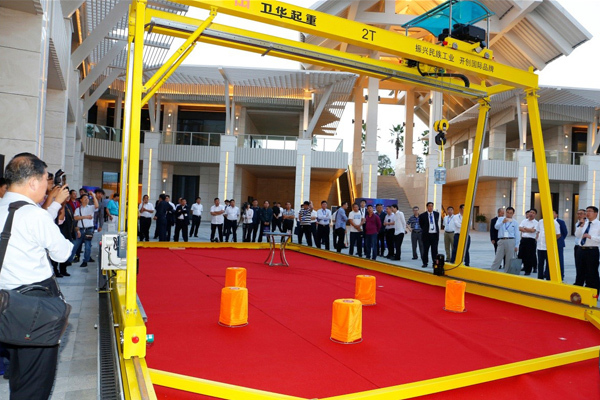 On January 26, 2018, Weihua Group hosted the "intelligent manufacturing, lifting the future" Crane Intelligent Development Seminar in Sanya. China Heavy Machinery Industry Association, Beijing Hoisting & Transport Machinery Design and Research Institute Co., Ltd., Changyuan County Industrial Park Administrative Committee and other government and association leaders, intelligent manufacturing experts and scholars at home and abroad, well-known enterprise representatives and Weihua Group executives, Business elites and other more than 400 people attended the seminar. 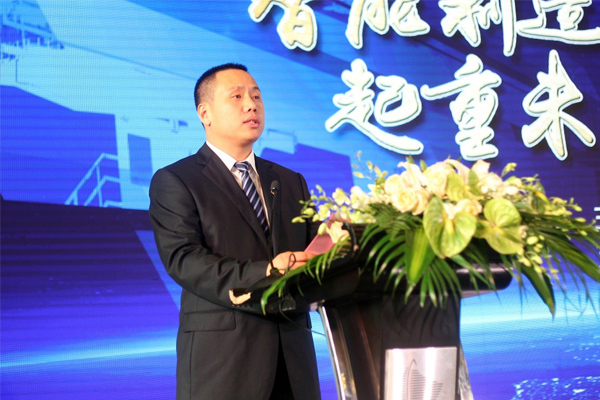 Han Hong'an, Chairman of Weihua Group, delivered an opening speech at the meeting. 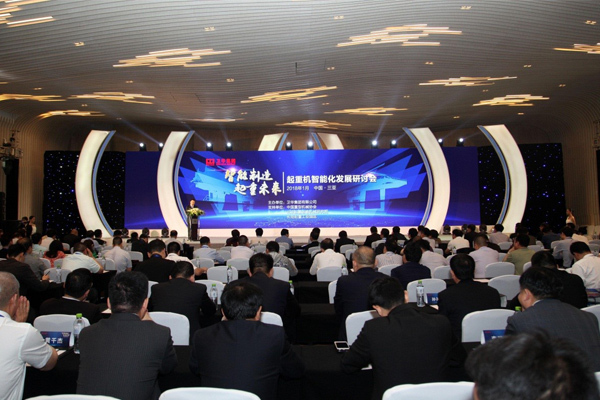 On behalf of Weihua Group, he first welcomed the experts, scholars and partners who attended the conference and thanked all friends who have long been concerned about supporting the development of crane and Weihua Group. Han Hong'an said that the combination and development of technology and manufacturing industry is booming. Digitization, networking and intelligence are increasingly becoming the major trends of development of the equipment manufacturing industry in the future. Combined with the practice of Weihua, Han Hongan believes that it is necessary for Weihua to be a standard-setter of key technologies and key industries. To be a technological leader, Weihua shall develop independent intellectual property rights of the core technology system, maintain the industry's leading technology position. 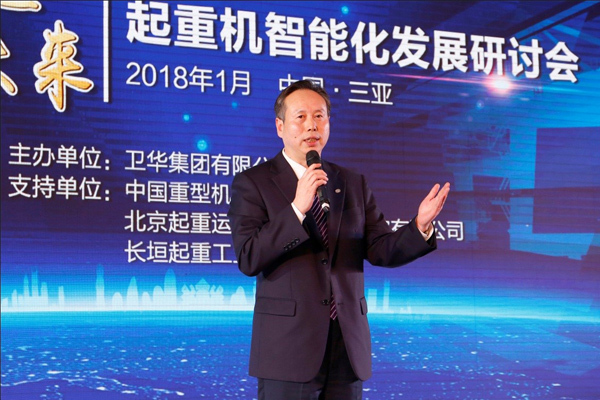 To be a platform builders, Weihua shall attract and build cutting-edge talent Heights, collect and precipitate data to create the industry ecology, and promote the integration of the industrial chain; To be service forerunner, Weihua shall respond faster to the market, tap the potential of equipment, suppliers, customers and other data, achieve full sharing of information on the up/downstream and depth integration, provide a continuous and powerful impetus for industrial restructuring and upgrading. Han Hong'an said Weihua Group will take this seminar as an opportunity to actively absorb the wisdom of experts and scholars, based on the actual development of intelligent crane needs to further optimize the industrial structure, to promote concrete measures to accelerate breakthroughs in core technologies to create an internationally renowned intelligence manufacturing enterprises. In his speech, Yu Youfei also briefly analyzed the situation of China's manufacturing industry and pointed out that intelligent manufacturing is the trend of the times. He said that in recent years, Weihua's research and development direction has been focused on green, intelligence and customization. Some achievements have been made on intelligent manufacturing based on the exploration of intelligent production, smart products and intelligent services. But for the endless pursuit of technology, Weihua in the smart manufacturing is still in the beginning stage, which need to pay more efforts to continuously improve and perfect. Building such a platform, Weihua is going to unite more power, gather more wisdom, experts and scholars with smart logistics, sourcing, users and suppliers to explore intelligent logistics technology to promote lifting technology upgrading of the logistics industry to achieve win-win. Weihua is willing to work with everyone to be the forerunner and explorer of the intelligent logistics industry. During the meeting, Wei Jiaing, researcher of Macroeconomic Research Department of Development Research Center of the State Council, leaders and experts such as Wang Jisheng, vice president and Secretary General of China Heavy Machinery Industry Association, principals of Schneider Electric, Shenyang Weide, Shanghai Mingjiang and other well-known enterprises and chief engineer Wu Jun from Weihua Group, made a wonderful speech and report. 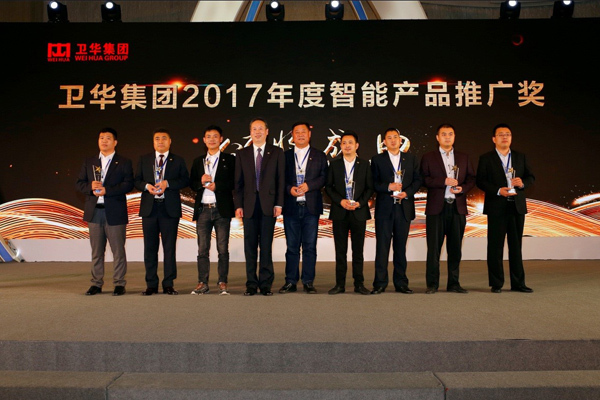 In recognition of the outstanding marketing model in the past year, at the meeting, the Group Awards sales champion, sales celebrities titles to them, hope to make persistent efforts in the new year 2018. 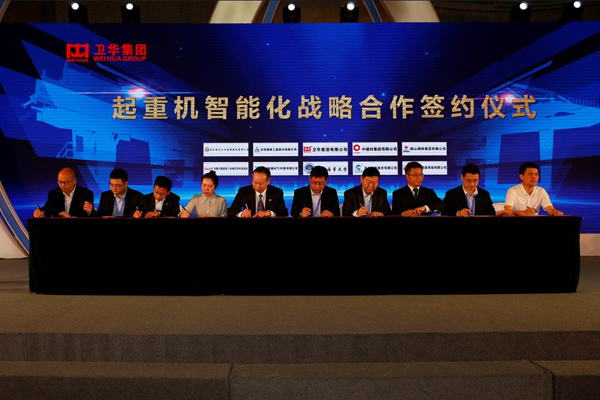 During the seminar, the Group also signed intelligence manufacturing strategic cooperation agreement with Chinalco International Engineering Co., Ltd., China State Building Materials Group Co., Ltd., Anshan Iron and Steel Group Co., Ltd., Yuanda Residential Industry Group Co., Ltd., Shanghai Maritime University, Shenyang Weide Construction Modernization Technology Group, Electric (China) Co., Ltd., Juli rig Co., Ltd., and Shanghai Ming-ming Intelligent Systems Co., Ltd.
After the meeting, the leaders and guests visited the latest high-end products with intelligence manufacturing and advanced technologies.